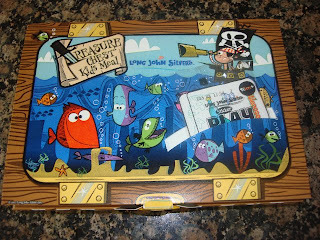 I don't remember eating at Long John Silver's before I met Bob but he's a big fish and chips fan so we'd go when we were first dating. Actually, his mom was working at a Long John Silver's right after high school and his dad came in and asked her out. So, obviously it's a romantic hotspot. We received some coupons to try out their new Freshside Grille menu, which features lighter options than the traditional battered and fried seafood. I definitely like being able to get steamed veggies and rice instead of slaw and french fries and the garlic butter sauce is nice. The grilled items (salmon, tilapia, shrimp scampi) are a tasty alternative to the heavier fried menu items. I have to admit, though, there is something awfully satisfying about a good greasing once in a while… And I love the hush puppies. 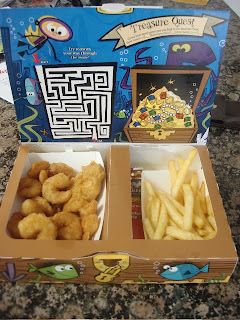 The whole Long John Silver's atmosphere has kind of a Spongebob/Pirates vibe that appeals to kids. We'd never taken Jasper and Roo before so I was surprised at how cute their kids' meals are. You can get fish, chicken or shrimp and choose between fries or goldfish crackers. The kids were really thrilled with the chocolate chip granola bars, too. It's been since High School that I've been to one of those, and all I remember were the pirate hats. I wonder if they still have them? I think I snatched one and wore it when I was a teenager. Their kids meals are too cute! Do you know I've never been into one of those restaurants?